The industry’s first automotive-grade Local Interconnect Network (LIN) System-in-Package (SiP) solution including a microcontroller with integrated touch hardware support is now available from Microchip. The SAMHA1GxxA microcontroller family contains capacitive touch hardware support, an event system and complex PWM capability. The series is ideal for touch button, touchpad, slider, wheel or proximity sensing applications, including optical and haptic feedback. 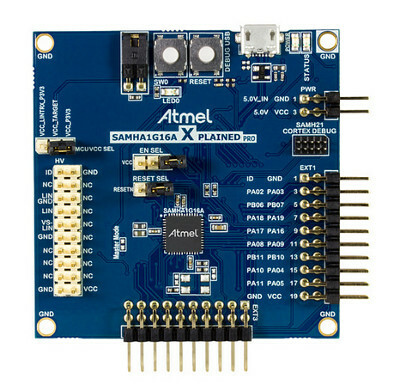 The SAMHA1GxxA contains an ARM® Cortex®-M0+ microcontroller (MCU), a LIN transceiver based on Microchip’s fourth-generation LIN IP and a voltage regulator. The system solution comes in a 7 × 7 mm QFN package, with wettable flanks ready for automatic optical solder inspection and is available with 16k, 32k or 64k Flash memory, up to 8 KB SRAM and 2 KB Read-While-Write Flash. The microcontroller family is automotive grade and designed to meet the high quality standards of the automotive industry. It features easy-to-create touch buttons with high sensitivity and outstanding noise immunity, supported by our QTouch® software function library. The high electromagnetic compatibility (EMC) robustness of the LIN communication is fulfilling the requirements of OEMs worldwide.